ZEIKOS FLASH-DS12. Slave Timing Modes Instant Sync. Hot Shoe Bracket. International Sales. Guide No. 46' (14.02 m) ISO100. Mount Shoe. Save lots of money, compare to Canon Speedlite 580EX II, 270EX, 430EX, 420EX. Compatible with all Canon EOS SLR & DSLR models. (sorry no bank or wire transfers). New Page 2. 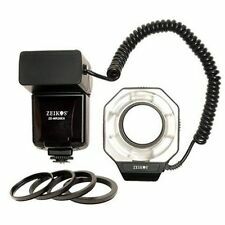 Zeikos Digital TTL Macro ringlight flash w/ adapter rings for Canon models w/ E-TTL & E-TTL II. Canon 300D. Canon 350D. Canon 760D. Canon 750D. Any other Canon Digital models with either E-TTL or E-TTL II. Product Key Features. Model ZE-440EX. Guide Number 148ft. Product Identifiers. Zeikos Professional Digital Slave Flash. Digital Slave Flash. Model ZE-DS12 with Bracket. Bracket Included. Flash ready indicator in viewfinder. Full digital TTL dedication. Find a lower price?. Autofocus Infra-Red Assistance beam. 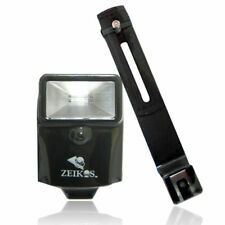 Zeikos ZE-RL36AF Digital LED Macro Ringlight Flash for Canon DSLRs w/Bonus Adapter Rings. The Zeikos ZE-RL36AF Universal Digital LED Macro Ringlight is perfect for all the close-up photographic needs you will ever have. Macro Ring Flash. PLUS MACRO FILTER KIT 1 2 4 10. MACRO FILTER KIT WILL ALLOW YOU TO GET CLOSE TO OBJECT. CHEAPER ALTERNATIVE WHEN COMPARED TO A MACRO LENS. This Macro Ring Flash can be adapted to any lens with a 52mm, 55mm, 58mm, 62mm, front thread. New/used condition Zeikos Professional Digitsl Flash in really good condition just minor scratches as shown in the pictures but works fine. 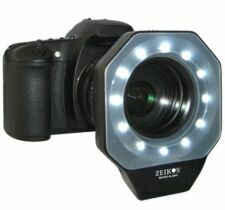 Zeikos ZE-RL36AF Digital LED Macro Ringlight Flash for Nikon DSLRs w/Bonus Adapter Rings. The Zeikos ZE-RL36AF Universal Digital LED Macro Ringlight is perfect for all the close-up photographic needs you will ever have. 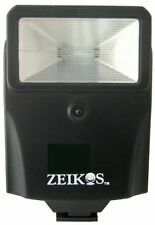 SALE : Zeikos ZE-690EX Professional AF Digital Flash w/ Wide Angle Diffuser . We will do our best to exceed your expectation. The picture you see is theactual item for sale. What you get is what you see. Zeikos ZE-MR26EX Digital TTL Macro Ringlight Flash for Canon. DIGITAL TTL MACRO RINGLIGHT FLASH FOR CANON. The Zeikos ZE-MR26EX Digital TTL Macro Ring Light Flash for Canon E-TTL I / E-TTL II is great for close-up photography. 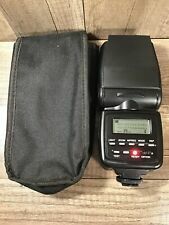 This Zeikos Digital Slave Flash is in Very Good Condition(see actual photos). The Zeikos ZE-RL36AF Universal Digital LED Macro Ringlight is perfect for all the close-up photographic needs you will ever have. It features 12 high powered continuous LED lights to illuminate your macro subjects. (Auto Slave Flash Unit. Normal mode) and remote flash photography (when switches to Slave on mode). flash instantaneously or that have single or multiple flash red-eye reduction system. Hot Shoe Bracket. New unopened item. Requires 2 AA batteries (not included). 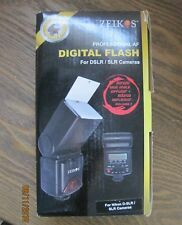 Unopened package, new Zeikos digital slave flash with bonus hot shoe bracket included. 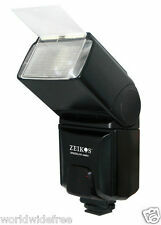 Zeikos Digital Slave Flash Bonus Hot Shoe Bracket Included Digital & SLR Cameras. Condition is New. Shipped with USPS First Class Package. Zeikos Digital Slave Flash with bracketis in Very Good Condition(see actual photos). This flash takes 2 AA batteries. INV: 13-4065. Zeikos Ze-440Ex Digital Slr Flash For Canon. Zeikos Ze-440Ex For Digital Slr Flash Canon. God bless you! We will try our best to resolve the issue! We will try our best to resolve the issue! The Zeikos ZE-440EX AF E-TTL Digital Flash for Canon E-TTL I & E-TTL II cameras is a wonderful compliment to any photographer's equipment list. It has a guide # of 148 and features zoom, bounce and swivel. It has full TTL dedication and an auto-focus infra-red assistance beam for low light conditions. It has red eye reduction and a second/rear curtain synchronization. It includes a built-in diffuser and a high quality bounce diffuser. Zeikos ZE-SB700 Flash Unit, signs of wear, see pictures. Fully operational. Zeikos ZE-RL36AF Digital LED Macro Ringlight Flash w/Bonus Adapter Rings. The Zeikos ZE-RL36AF Universal Digital LED Macro Ringlight is perfect for all the close-up photographic needs you will ever have. MACRO RINGLIGHT FLASH FOR. This MACRO RINGLIGHT FLASH can be adapted to any lens with a 52mm (fixed ring size on flash), 55mm, 58mm, or 62mm lens thread. (Adapter rings are included). 10D TI 400D G2 REBEL 3000 EO533 EOS30.